As Originally published by M.A.S.E. LLC, September/October 2004. These are alarming numbers, but isn't the problem solved? Most people are aware of the media coverage given three-wheeled all-terrain vehicle accidents in the early 1980's. When manufacturers agreed to quit manufacturing three-wheeled ATV's as a result of a suit brought against them by the United States Department of Justice, many people thought the problem had been solved. People failed to realize that the same characteristics that made three-wheel ATV's unstable and unreasonably dangerous, also make many four-wheel ATV's unstable and unreasonably dangerous. Also of note is the fact that although acknowledging the problems with three-wheeled ATV's and agreeing to stop production, ATV manufacturers did not recall any of the millions of three-wheeled ATV's already on the market. The hierarchy of design is a standard engineering design procedure, suggested by the National Safety Council, found in many engineering design textbooks, and discussed in previous editions of ForensicClues. The hierarchy calls for eliminating a hazard out of a design as the first and utmost priority. Much of the instability of ATV's could be reduced drastically if differentials would be used on the rear axles. If this cannot be accomplished, then the next level of hazard-reduction is to provide a safeguard that will keep the hazard from coming into contact with the user. In the case of all-terrain vehicles, safeguarding the hazard would include a roll-over protective structure (ROPS) and a seatbelt. The third priority of the design hierarchy is to warn of the danger. Warnings on most ATV's are not applicable since due to the lack of a differential, the warning would have to read "Do not turn the ATV". The design hierarchy continues downward in rank to the fourth priority - reducing hazard impact with behavioral training. The fifth priority in the design hierarchy is the least effective, providing personal protection. Manufacturers of products sold to the public cannot violate this safety design standard and arbitrarily select lower priorities that are less effective when solutions are available that are more effective. If this were not true, then seat belts in automobiles can be eliminated with a safety sticker saying, "Drive Carefully". 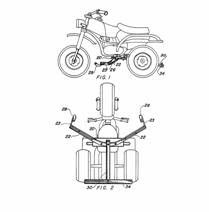 Problem - High Center of gravity, prone to overturn rearwards if ATV is accelerated on hills. Geometric configuration and weight distribution of an ATV makes it likely to rollover during a turn and prone to roll-over backwards when ascending a hill. Solution - Lower center of gravity, add wheelie bars, side outriggers, roll-over protection. The hierarchy of design calls for the hazard to be designed away if possible. In this case, this would involve lowering the center of gravity of the all-terrain vehicle, making it much more difficult to overturn. Problem : Makes turning difficult, more likely to overturn. The lack of a differential makes turning the all-terrain vehicle difficult. Automobiles have a functioning differential that aids in turning. As the steering wheel of an automobile is turned, the differential implements a change in the rotational speed of the different wheels. For the inner wheel, the differential gears the wheel to turn slower. The outer wheel spins faster since it has more ground to cover to perform the same turn that the inner wheel is performing. Figure 2: A standard differential. Without a differential, an ATV relies on the strength and skill of the operator to effectively maneuver the vehicle. This lack of a differential can also cause problems when a driver is attempting to avoid an obstacle and decelerate at the same time. If the wheels are turned when the brakes are applied hard, the ATV may not perform as the operator is expecting. The operator will probably be expecting the ATV to turn. Without a differential, the ATV must rely on the drive of the axle to effect turns. Depending on several variable factors including the coefficient of friction of the surface the ATV is being operated on, the ATV can "plow forward" with the wheels locked, instead of the ATV decelerating and turning to avoid the obstacle. Solution - Incorporate a rear differential into ATV. The open-type of differential operates by balancing the torque load on both wheels, which is fine when both tires have the same frictional resistance. When one wheel slips, there is little torque on either wheel. The vehicle could get stuck easily. Limited-slipdifferentials get away from this problem by biasing to the wheel with the greater friction. There is less chance of getting stuck. Locker differentials allow the user to select when the two wheels are locked together. If the vehicle is stuck, the two wheels can be locked together to get the ATV moving. When the differential is unlocked the ATV has maximum control. Without a differential, the solid shaft creates a Locker situation, and there is no chance to totally control the ATV. Since there are three options available, there is no excuse in not using a rear differential to design out the hazard, which is the first priority in the National Safety Council's list. Problem : Failure to incorporate a rollover protection system (ROPS). The court system has shown repeatedly that tractor manufacturers are producing a defective product when produced without a ROPS. The variety and extremities of the terrain encountered with ATV's can result in forces that will exceed the vehicle's ability to remain upright. Solution - Add rollover protection system to ATV. The roll cage in Figure 4 raised the center of gravity by only 3 inches, which can easily be corrected by adding Hydrofill to the ATV tires. A rollover bar similar to tractor ROPS is another possibility. All ROPS require seat belts for realization of their safety potential. Tractor users have been crushed despite ROPS when thrown from the operator's seat. ATV manufacturers make ATV's for children. This fact is well known by consumers, which influences children to ride adult ATV's. These ATV's go and do what the big ATV's do. Children, six-years-old, drive ATV's. Subtle differences exist between the adult and child models such as throttle stops to control speed and centrifugal clutches to remove the complexity of shifting, but these differences are not obvious to parents unskilled in the technology of ATV's. The successive approximation procedure is a psychological procedure proven in laboratories to increase the rate at which a behavior is learned. This procedure, also known as shaping, involves reinforcing a behavior that is close to the desired response. This theory is used in advertising by companies when they produce children's "approximations" of adult consumables like cell phones, cars, etc. Children obtain satisfaction from playing with their children's ATV's. Psychological theory holds that generalization occurs when a person responds in the same way to similar stimuli. This means that parents and children are likely to expect the same fun and "safe" excitement from a full size ATV found on children's models. Figure 6: Children's ATV infers children can use ATV's too! The sad fact is that the majority of ATV injuries and fatalities occur to children. Parents and children have been deceived to think that ATV's are a modern day go-cart. Solution - Education, training, ban children's all-terrain vehicles, make all-terrain vehicles safe!